"Nadiya Ke Paar" is a 1982 hindi film which has Sachin Pilgaonkar, Sadhna Singh, Mitali, Inder Thakur, Savita Bajaj, Shiela, Leela Mishra, Ram Mohan and Sonia in lead roles. 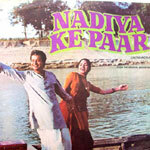 We have 5 songs lyrics and 5 video songs of Nadiya Ke Paar. Ravindra Jain has composed its music. Suresh Wadkar, Hemlata, Jaspal Singh, Sushil Kumar and Chandrani Mukherjee have sung these songs while Ravindra Jain has penned its lyrics.